Annual greenhouse gas emissions resulting from the use of linear tube fluorescent lamps have been estimated at around 13 Mt CO2-e and growing. Did you know that linear tube fluorescents account for over half (58%) of the combined lighting energy consumption and greenhouse gas emissions in Australia’s industrial, commercial and residential sectors? 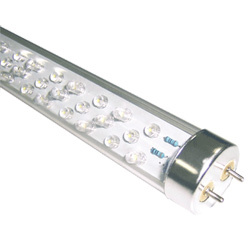 Our LED Tube Lights use up to 70% less electricity than regular lamps. They feature the highest quality LEDs, emitting the same amount of brightness as conventional T series fluorescent lights, but at a substantially reduced cost and last up to 10 times longer with low loss of illumination. These provide a great source of general illumination, suitable for use in offices, factories, supermarkets, buses, trains, task lighting, store displays, warehouse illumination and under cabinets. They come in warm white (3,500k), cool white (4,500k) and daylight (6,500k) and lengths of 600mm, 1200mm and 1500m. The tubes will last up to 10 years and or 100,000 hours compared to a standard fluorescent at about 8,000 hours.